The Wine Institute was geared up for a major fight with President Obama before the proposed federal budget was released, because some in the administration advocated eliminating the TTB, the agency that governs alcohol. When the budget came out, no such major change was included. There was a tiny change proposed, allowing IRS investigators to work on excise tax violations of alcohol law. 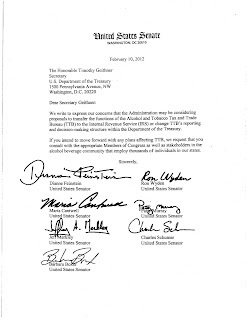 The Wine Institute was ready anyway with a letter (at left) signed by seven US Senators opposing the change. I'm not a tax expert, so I decided to look into it and find out why. "The Alcohol and Tobacco Tax and Trade Bureau (TTB) in Treasury currently collects alcohol excise taxes, but they do not have the manpower to initiate enforcement investigations. Last year, both the House and Senate included funding for TTB to hire agents to enforce the collection of these taxes. Rather than have TTB start a new agent cadre, the Budget proposes to allow existing IRS agents to enforce this provision on the behalf of TTB. This is not a new tax, just the enforcement of an existing one, and the Budget tries to enforce compliance in the more efficient way." That makes sense to me and I don't really understand why the Wine Institute and seven US Senators oppose it. Nor will I. The Wine Institute refused to answer my questions about it, saying only (again "on background," not from a quotable source) that "we don't think the proposal has a chance of being approved." Cocky. If the idea of rubbing elbows with some of the great historic figures in California wine appeals to you, next Monday is your chance. Tickets are still available for the 6th Vintners Hall of Fame induction ceremony on Monday, Feb. 20. The event is much more affordable this year: $175, which includes dinner and plenty of wines from Hall member-associated wineries -- as well as wines that have been served in the past at the White House. Dinner is again in the popular walk-around format in the CIA kitchens. CIA graduate chefs, some who are now culinary celebrities, will each prepare one signature dish. I hope Rep. Mike Thompson is also once again making and serving his own risotto. It takes chutzpah for a Congressman to play chef in that crowd, but the man can cook. The emotional highlight this year might be when 95-year-old Peter Mondavi, Sr. is inducted. It will also be nice to see Richard Sanford recognized for his pioneering role on the Central Coast. But you never know how funny or moving the ceremony for individual inductees might be. Last year, the relatives of August Sebastiani made his induction a highlight. This year's induction class: Joe Heitz, Eugene Hilgard, Peter Mondavi, Sr., Myron Nightingale, John Parducci, Richard Sanford, Albert Winkler. If you'd like to mingle with me for some reason -- normally I'm relatively interesting, but not in this crowd -- I'll be there as my role as Chairman of the Electoral College. I'll be trying to soak up some of the oral history of wine. The presence of so many good wines usually helps facilitate that. Here's a link for ticket info.Hope to see you there. California is releasing 34,000 non-violent prisoners because of a federal court order on overcrowding, which means anybody who commits crimes against property, not people, has a pretty good chance of walking free these days. Fortunately, the worst wine villain of this millennium was tried in federal court, not state court. Mark Christian Anderson might not serve all of the 27-year sentence he got Tuesday, but it's a pretty good bet that he's had his last glass of wine for at least a decade. Good. 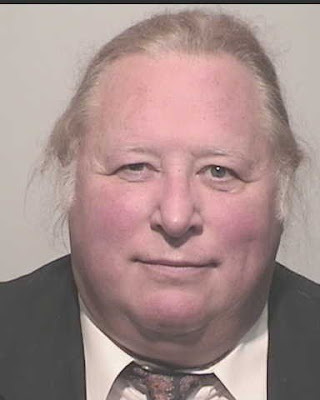 This is a guy who stole from other people's wine collections, and when facing charges for embezzling, he tried to destroy the evidence by torching a giant wine warehouse, destroying 6 million bottles of wine. The repercussions were horrible: some wineries, like Saintsbury, lost their entire libraries. Perhaps it's unseemly for me to cheer bloodthirstily for Anderson's sentence, which was more than 11 years longer than the prosecutor recommended. That's a HUGE difference, and might mean Anderson, 63 -- who has been in prison since 2007 -- never gets out. It's certainly not good journalism on my part, as I worked on the news stories seven years ago about the arson. But it was never my job to cover the trial, only the impact on the wineries involved, and it was immense. Example: Realm Cellars lost an entire vintage when it was just starting out. Normally that would be a story, but I talked to so many better-known wineries that were also devastated that I didn't even have space for it. 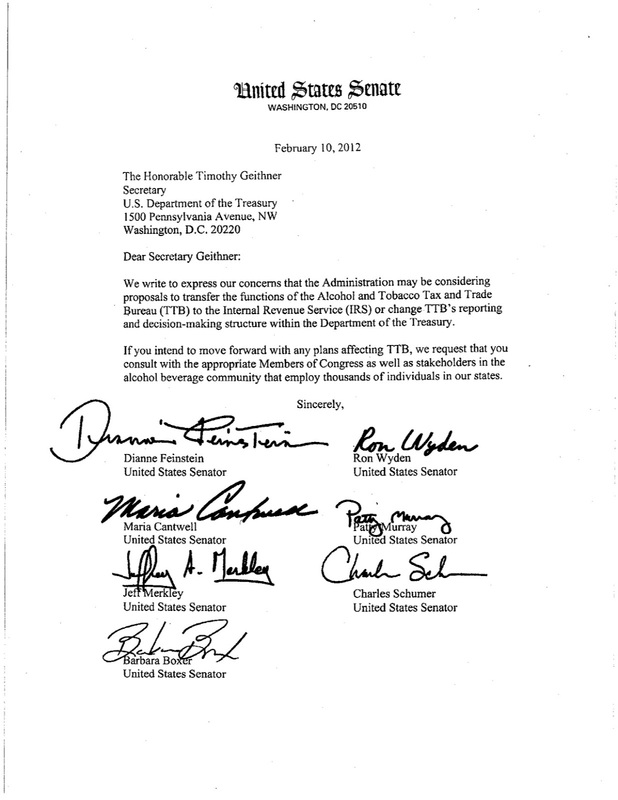 US alcohol law could be on the verge of a huge shakeup. The Obama administration is considering eliminating the TTB, the agency currently in charge, and divvying up its duties between the IRS and the FDA. The implications are huge, and the wine industry is afraid -- although it might be a good move for consumers. But I might be wrong, as the FDA doesn't do a good job of regulating food. And one wine industry spokesman described the move as a "power grab" by the FDA. The IRS would collect taxes; the FDA would be in charge of everything else. 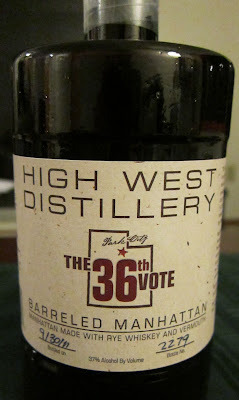 And here's one I'd like to see: More accurate labeling of alcohol percentage. The nix-the-TTB suggestion was in a memo last year from the Office of Management and Budget to the Treasury Department. Next week, when the new federal budget proposal is delivered, we'll see if the White House is planning to go forward. 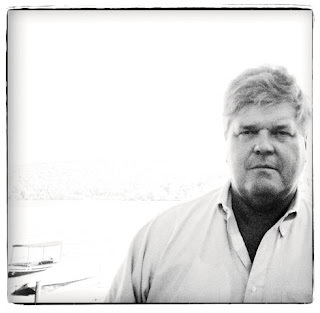 To discuss what the move might mean, I called Michael Kaiser, director of communications for Wine America, which represents wineries in dealing with Congress.